Following the exceptional wave of bad weather that struck the Marche and Abruzzo in recent weeks, Enel undertakes to pay to customers, in addition to automatic compensation provided by the authority for electricity and gas, additional compensation for damages incurred as a result of the power outage. 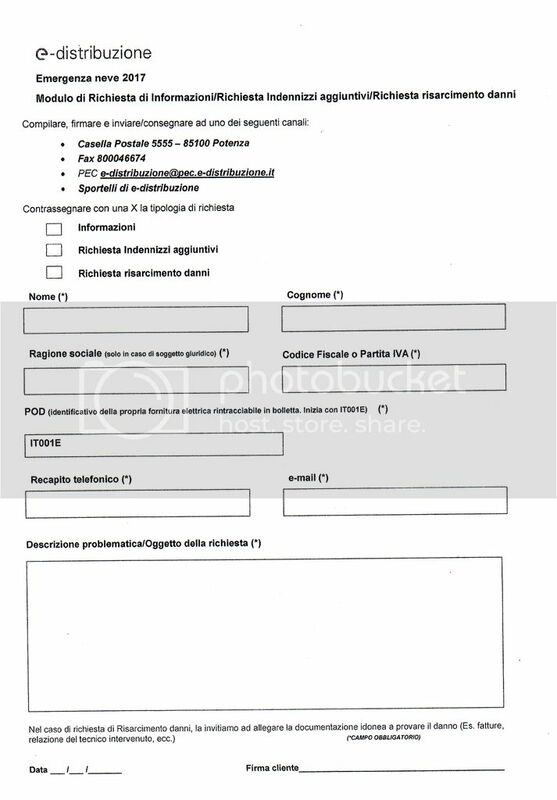 The form for the request can be made at the counters of Pescara, Teramo and Chieti, Ascoli Piceno. I had thought for a while that the on-off, on-off had damaged one of my wall mounted climate units as it would no longer turn on. Then, last week, I flicked a wall switch I had forgot about and heard a 'beep' from the other room. After a short face palm, I was relieved that I had not called for service. This is the form you need for damage claims against ENEL. Sorry it's in image form, this is how I received it. Has any one received this compensation as I was notified in May of the compensation amount, filled in and returned the enclosed forms but nothing has arrived in my Italian bank account! I got a letter a few months ago which said go to the post office with the usual documentation, and I got â‚¬100 back. Didn't request it and couldn't believe how simple it was. Well, having written to me, 3 times, to tell me they would pay â‚¬300 compensation for 9 dayâ€™s without electricity, they have now paid â‚¬90 into my bank account. Whatâ€™s happened to the other â‚¬210 I wonder? On our bills they first off told us we were getting â‚¬300, then an additional â‚¬30. For a few bills (2-3) they simply deducted the bill amount from our in credit account, then with 252 or so still in credit they sent us a cheque (we do not pay DD) for that amount and we've been back to normal bill since (August). All in all, including paying in a cheque, no hassle at all and very nice to have such serice - and the cash of course! NB No letters and no form to fill in? So, we need to get our Sanitaira cards anyway, so this will give us the motivation to get them sorted. If anyone can tell me how to get one of these cf photo-cards I would be grateful! I have a cf number but just need the card. For your CF card you need to go to the local AdE office - see their link here . You say you have a number, but was this on a officially issued document with a Consulate stamp? Don't know about the ENEL bill payment, but the Post Office should accept this document as last we were told is you don't have to have a plastic card if you have a certified paper document from the Consulate - just showing a number won't do. It's rare now for our Post Office to ask us for our CF (paper), but then again they know us! All different experiences for us, we got a large refund on electricity bill re loss of power in January without applying and got a refund of tv licence without applying. Very happy though.